Josephine Joy was born in West Virginia, grew up in Illinois, and spent her later years in California. 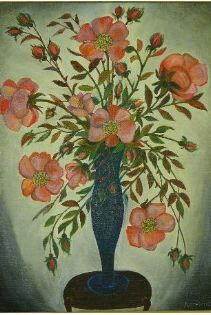 Although always aware of her talent as a painter, she only had the opportunity to develop her art after the death of her second husband in 1927. Financial hardships during the Depression forced her to seek assistance from the WPA’s California Art Project. This association proved to be a turning point in her life as an artist. By 1940, her work had been publicly displayed at such places as the San Diego Museum of Fine Arts and the Los Angeles Museum of Fine Arts. Joy was brought to the attention of Sidney Janis, and in 1942 she was included in his book They Taught Themselves. That same year, several of her paintings were displayed and purchased by the Museum of Modern Art, and in the spring of 1943 her work was shown at the Galerie St. Etienne, eliciting a favorable review in Art News. Joy was also included in the 1981 exhibition In Their Own Way at the National Museum of Art, Smithsonian Institution.